Treasures Jewelers recently celebrated their 19th anniversary. In 1991 the Bohall family business was started in Peoria, Arizona. In 2001 Scott and Danielle built their beautiful new store in the Arrowhead area. The store features a full service manufacturing shop, an Accredited Gem Laboratory and a large showroom that displays the latest in quality gold, diamonds, platinum, and gemstone jewelry. Since their move to the Arrowhead location, Treasures Custom Jewelers has grown into one of the largest full service, family owned jewelry stores. Scott grew up in South Dakota with a rock collection and eventually transitioned into gems. He worked his way into the industry by being able to identify many rare and unusual gemstones. 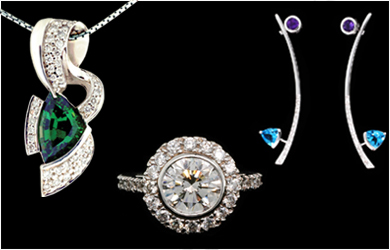 Scott designs much of the jewelry but also employs other great designers. His passion is owning a jewelry store that helps people bring forth their own style - this is more like match-making than selling jewelry. And why not... jewelry is normally attached to a significant occasion, milestone, or romantic moment. Danielle grew up in Long Island NY, also had a rock collection early on and was always interested in jewelry. When the couple met, it was Danielle who had the vision for Treasures. Their daughter, Jessica Bohr, achieved her own recognition by being the youngest award winning designer in the state. Conveniently located at 67th Ave & loop 101. A short drive from the surrounding communities of Peoria, Glendale, Scottsdale, Phoenix, Sun City & Sun City West. © Treasures Custom Jewelry & Diamond Brokers.